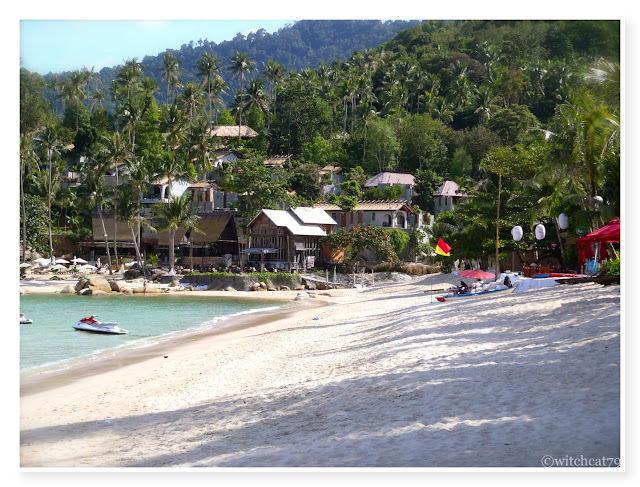 everyone should be familiar with koh samui but how about koh pha ngan? just to be geographically correct, koh pha ngan is actually an island in the Gulf of Thailand, in south east thailand; located in the surat thani province. 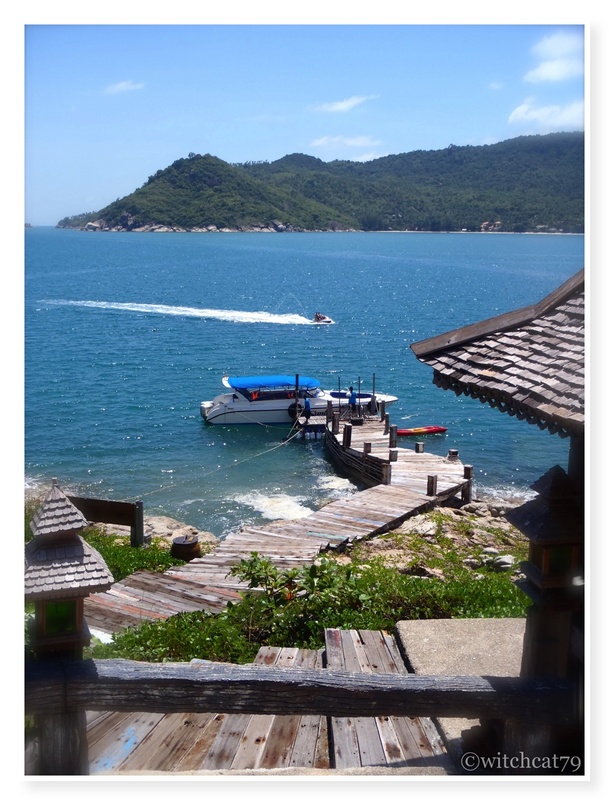 basically, it is the island between koh samui (in the south) and koh tao (in the north) - check out our previous trip to koh tao here! probably this season (oct-feb) isn't a good time to go as there's high possibility of wet weather throughout the week. but fortunately, the weather was good for the 5 out of 6 days i was there. the best period with sunny days would be jun-sept.
there are much to do on the island especially if you're a sunshine-outdoor traveller. 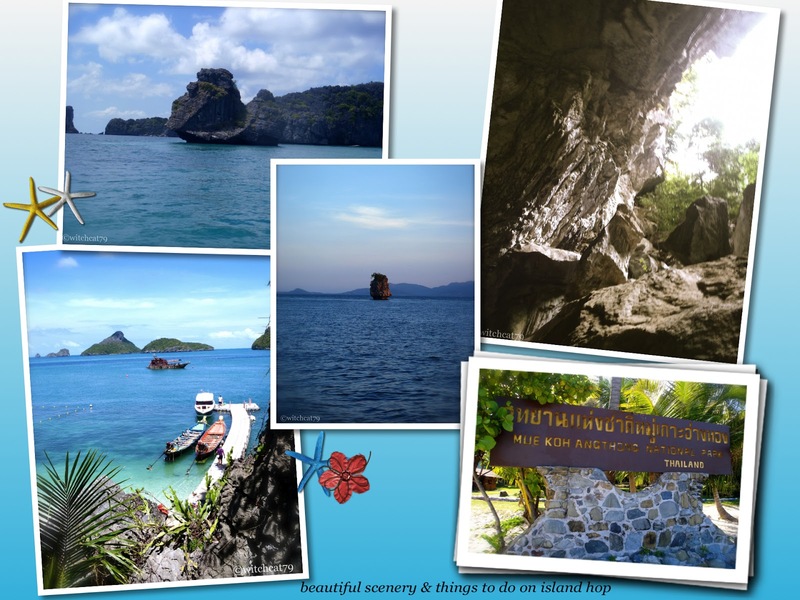 there are island-hops in within the koh anthong marine park that you'll enjoy kayaking, snorkelling and exploring the islands by foot. check out the lagoons, caves and challenging peaks to climb as there provide great photographic opportunities. but if you just want to take things easy, the beaches are beautiful for you to get your desired tan - just make sure you slap on enough SPF protection. 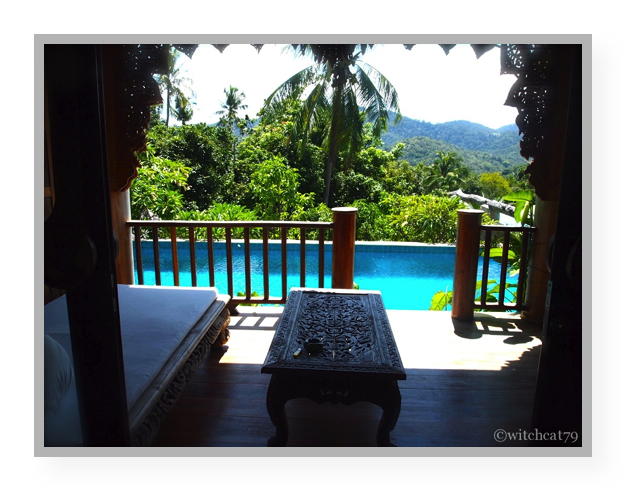 actually i would prefer to tok about the resort that we picked to stay-in! 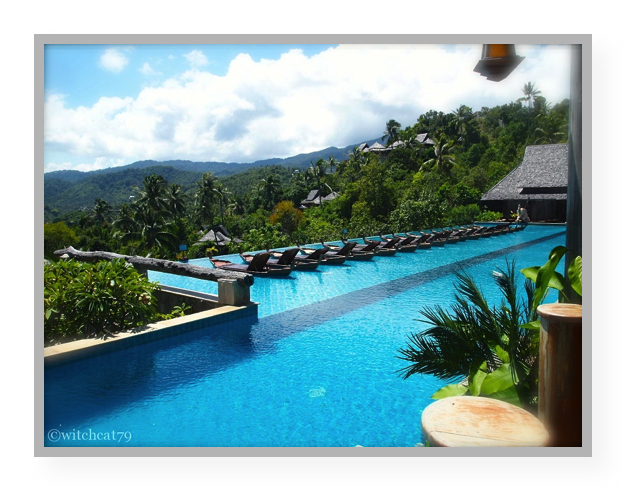 it's the Santhiya Koh Pha Ngan Resort & Spa located in the Thong Pai Nam beach; one of the secluded beach up north of the island. 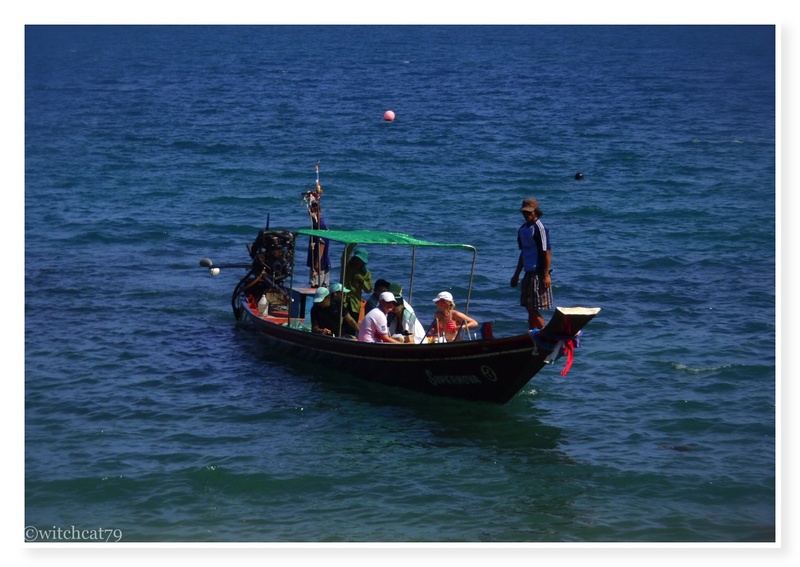 to get there, fly to koh samui and get a boat transfer from the Petcharat pier. there's also a land trasnfer if you don't mind the bumpy road from Thongsala pier. 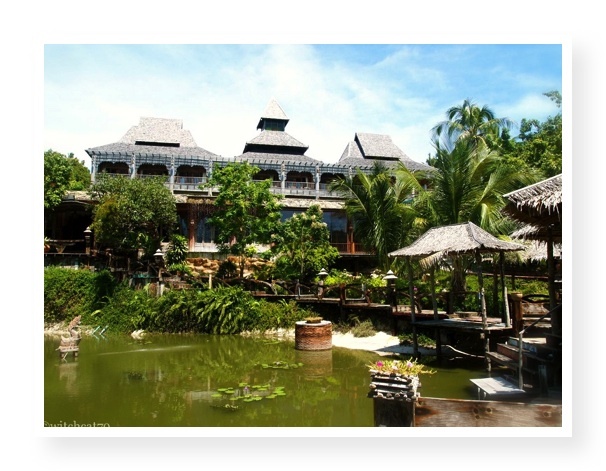 my recommendation is to get the resort to arrange for you at THB1500/ trip; where they will pick you up at the koh samui airport with a pretty nice resort a/c van and a speed boat transfer on their private resort boat. i really appreciate the icy cold white towels and mineral water that they provide from the moment you step into the van and on board the speed boat, especially on a hot sunny day. i also highly recommend that you book yourself on an early flight to reach koh samui's airport as the boat transfer to the resort had only 2 timings; 11am and 4.30pm. 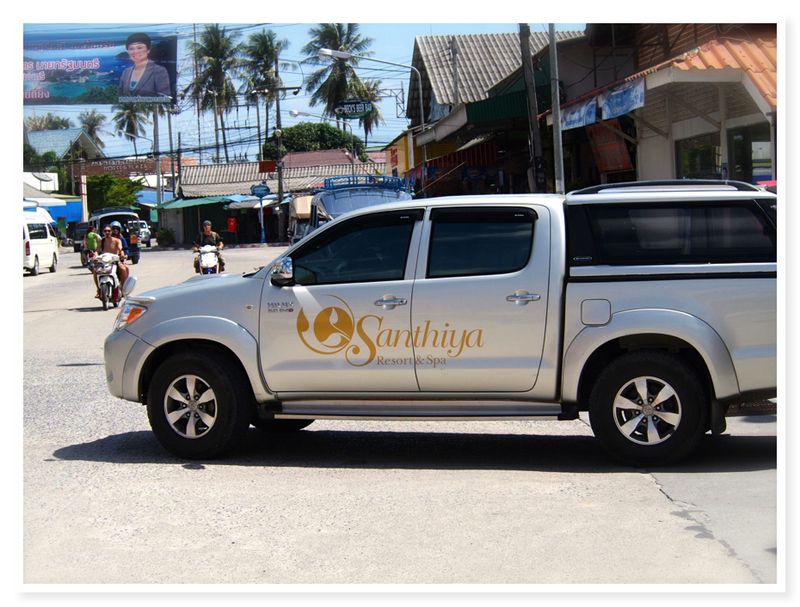 check zuji for good rates and you should be able to find a 8.10am flight from singapore-koh samui which would allow you and the resort to arrange for the 11am transfer. this is perfect as you don't have to check into any hotels in koh samui for a-night. and by the time you reach the resort; boat transfer is merely 30mins, you'll have almost half the day to settle in and settle down - great! 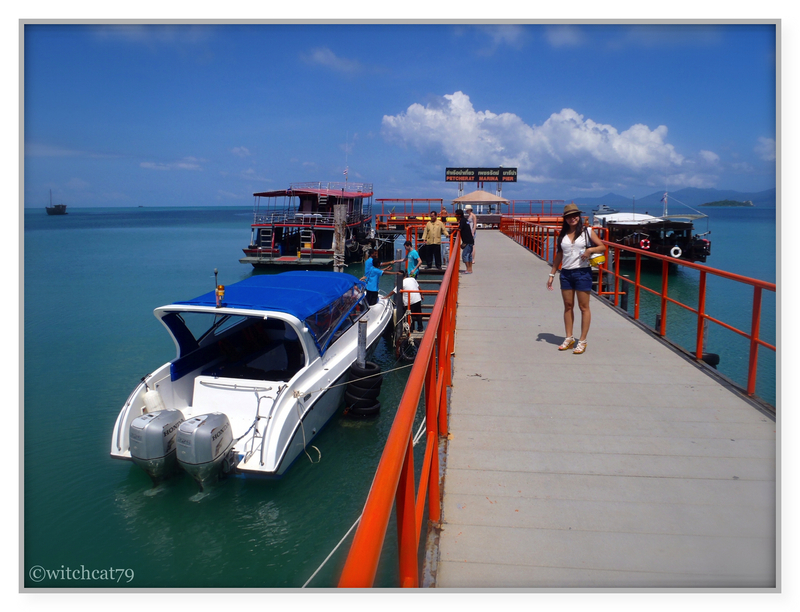 as santhiya resort is located in a private beach area of the island, they have their little pier too. upon arrival, we were greeted by the resort's team who were as enthusiastic as you are. it was a warm welcome although the pier was simple. we were then leaded by the staff to the lobby which provided us a tour of the resort from the beach front all the way upwards, which is the geographic uniqueness of this resort - build on a hill. 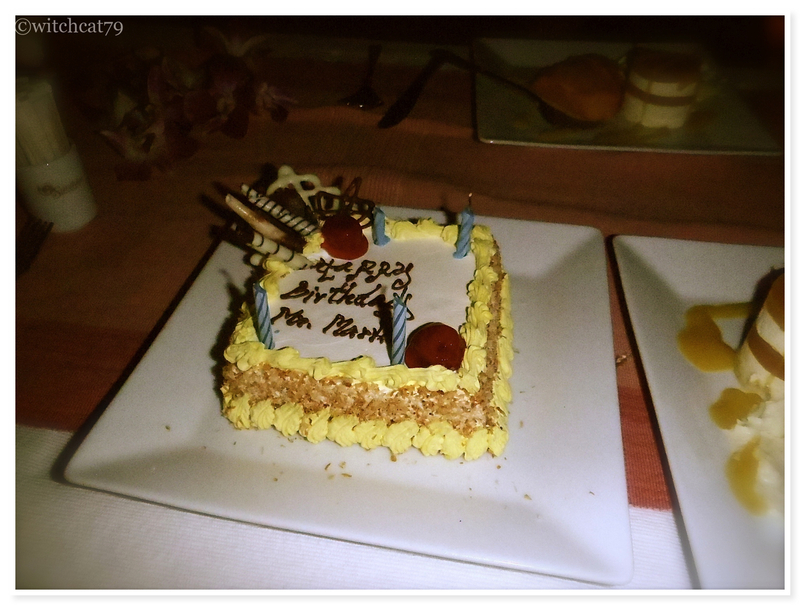 at the lobby, there were light refreshments for the guests and a welcome briefing from a resort representative. 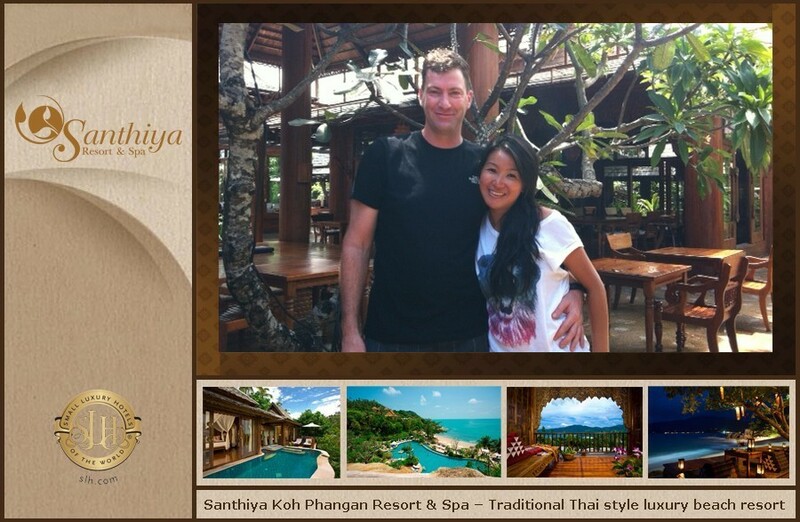 once we were done with the check-in procedure, i was ushered with my partner to our room. 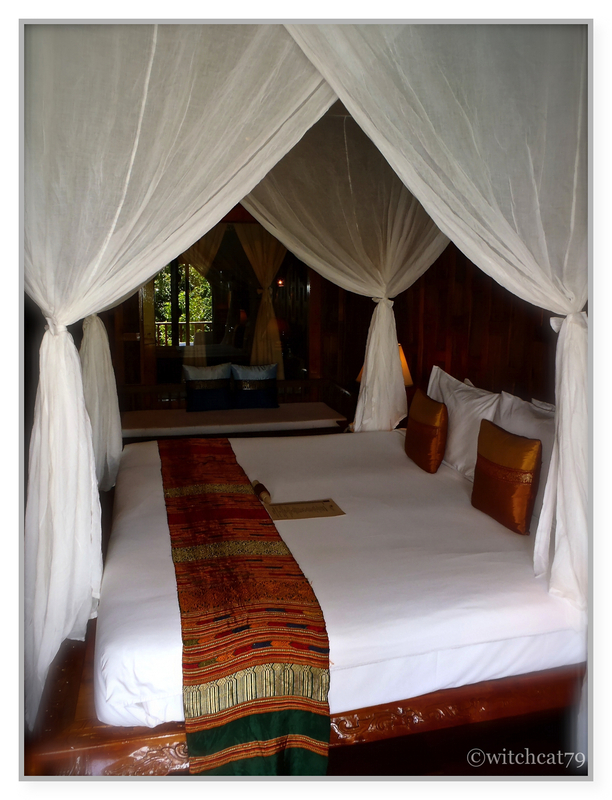 we selected the super deluxe room with pool access. it's a mid range room type and there's many different types of rooms that you can choose from depending on your budget and preference. 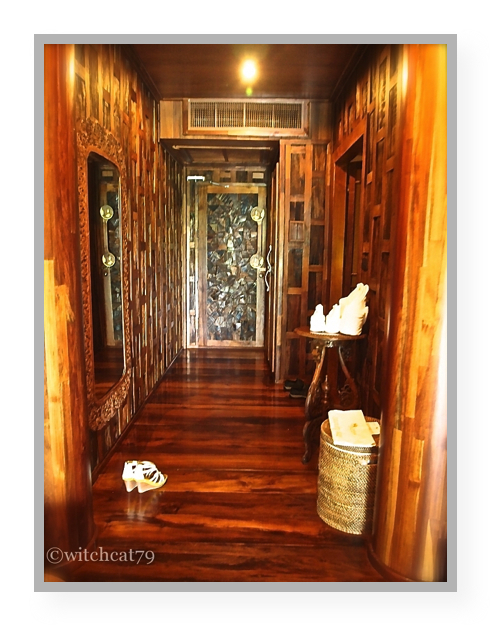 apart from the interior of the room which were oh-so thai, there were many other details that i really love. 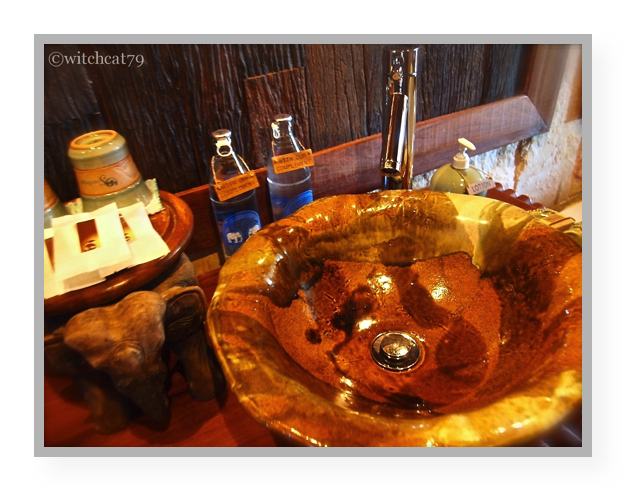 the resort had definitely put in enough thoughts and care providing all the important necessasity for their guest. apart from the usual hair dryer, lotion and bath essentials, the room was also equiped with rubber beach slippers, roomy beach bag, traditional all-weather umbrella and a universal plug which i've used them throughout my 6days; be it in within the resort or outside the resort. 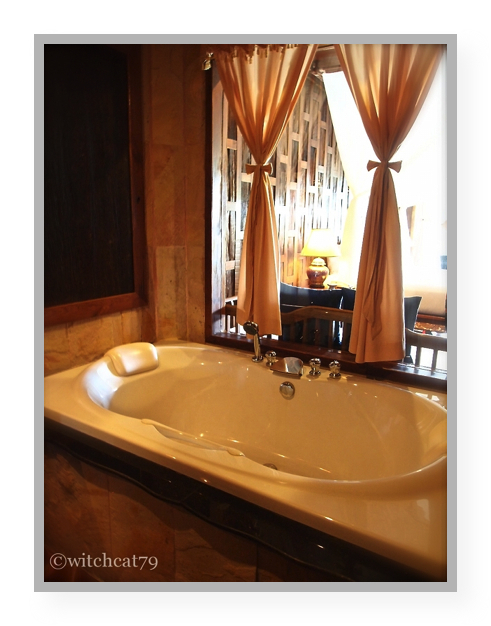 spacious bathroom with a "view"
the super deluxe room with pool access provide the greenery view without the seaview. but the pool access is good enough to fill up the missing-blue. if you really need to soak your feet in white sands and also to check out any hot babes or hunks staying in the resort, there's always the main pool which you definitely have to get your tan there, at least for one day. there were also 2 man-made waterfall which i had some strong shoulder massage sitting underneath it. 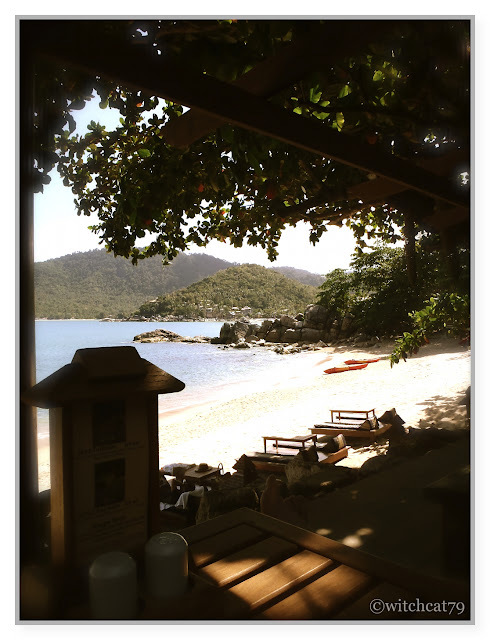 there is the also a by-the-sea-bar that serves both food and drinks while you're sun-bathing or be under the shade, laze on the thai-lounging-cushion in the bar itself. all that, you're still enjoying the view of the private beach. 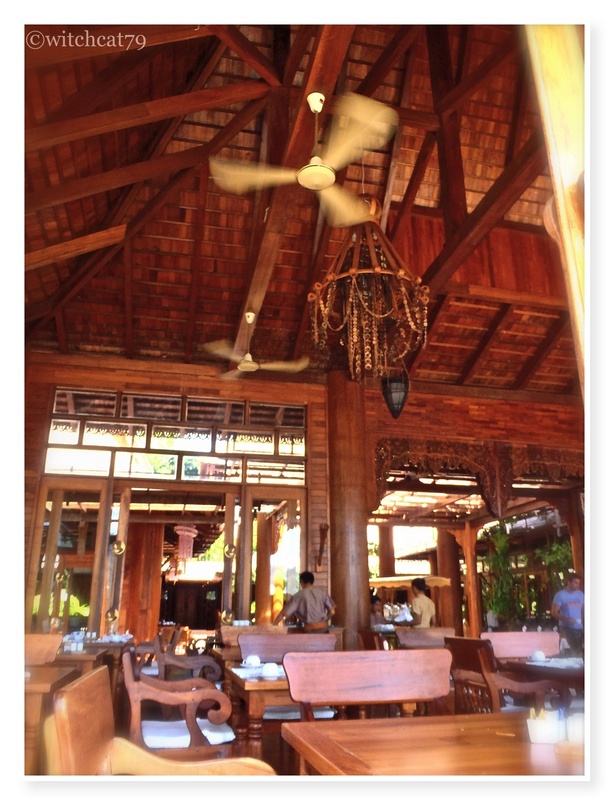 during our stay, we spend most of our time outside the resort. but if you just need to relax, there's also a comfortable library and internet area which you can stretch your feet to read or surf the web. i totally like the idea of free dvd movies rental that the resort offer. not a wide selection; but it's good enough for some stay-in, cuddle-in-the-bed time. if you're in for a workout, there's also a fitness centre which i did a bit of slow walk and climb on one of it's machine. you don't even need your ipod as the fitness centre was pumped up with workout music which definitely help in my workout there. it's not fancy but definitely sufficient for a good workout. the fitness centre is ready with drinking water and towels so you bascially just need to be there with your workout attire - i appreciate that. 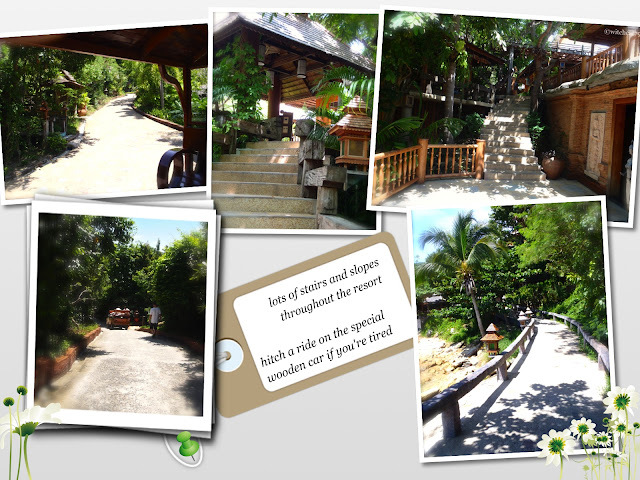 but if you're burnout for the day, there's the regular shuttle service that the resort provide for the guests. there are little stop at every section of the resort; probably segmented according to the room type, where the shuttle service will stop for the guest. 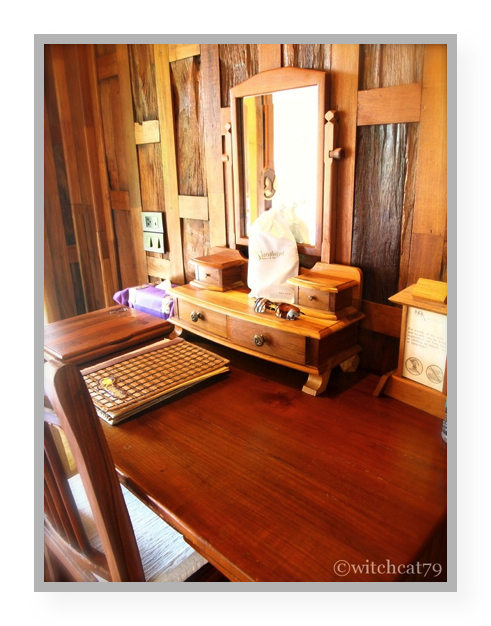 and be surprised with the resort's customised wooden car used for the shuttle service - definitely unique! just in case you're bored or prefer something different during your stay, there's a little village over the boulders that separate the resort's private beach. 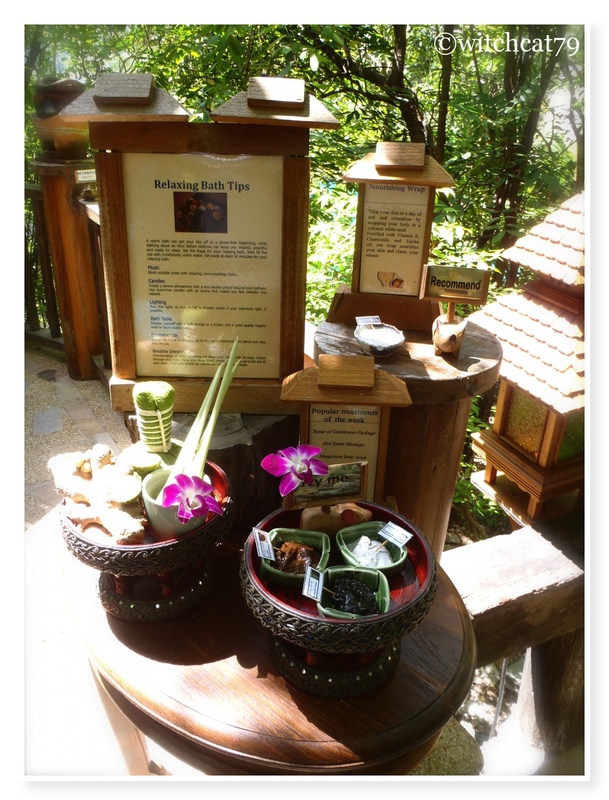 you can grab some simple toiletries, souvenirs and enjoy very affordable thai massage in the village. there's also a number of mini tour agency that organise daily island-hop trips and land transfer to the main city. i enjoy crossing over to meet more people in the beach bars of different resorts and also experience a different view of the stretch of beach at this part of the island. 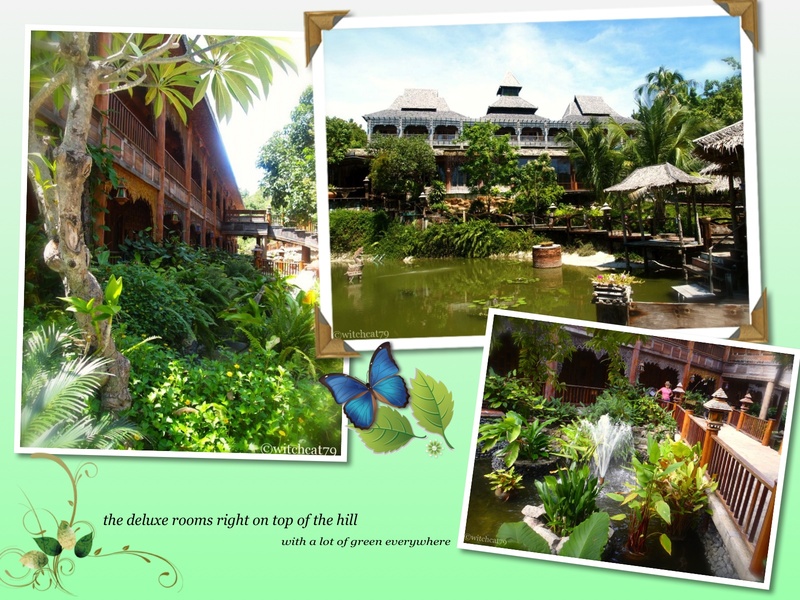 but there was a day where both my legs were too heavy to be lifted, i found myself spend the day exploring the resort. 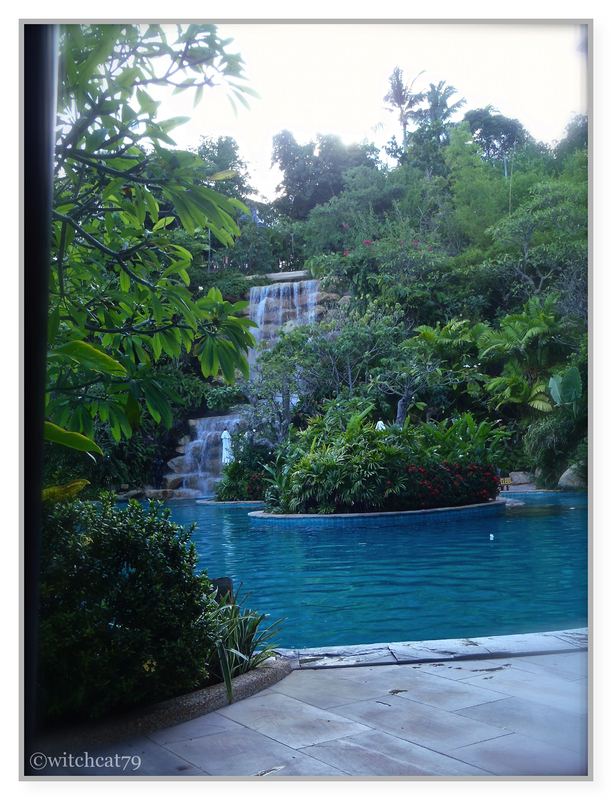 with 18acres of tropical landscapes, you can definitely find a spot to park yourself. apart from the sea bar, there's also the chantara restaurant which serves all 3 meals of the day with a spectacular dining view. it was a shame that i didn't manage to book myself for a spa service in within the resort but i'm sure it'll be divine since there's a wide range to choose from. but i did indulge in a little shopping in the resort's retail shop - oh, did i also mentioned that most of things you find in your room can be purchased home? during our last day, we managed to catch a traditional musical instrument's perfomance at the main activity area right in front of the lobby - Ruen Chanvimol. 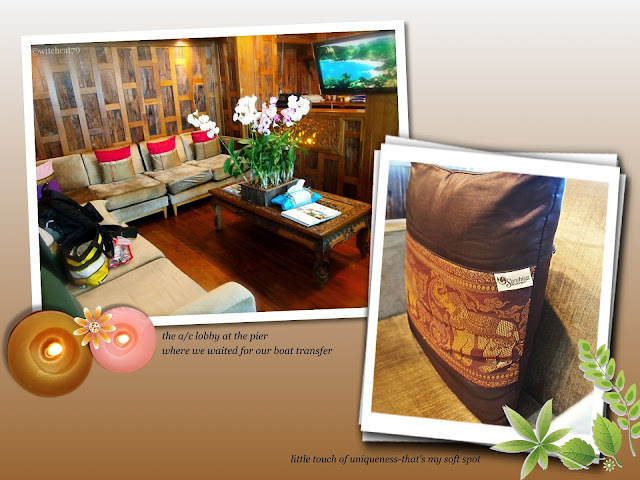 simply relax in one of the lounge-cushion and enjoy the soothing music played by a pretty lady musician. apart from doing all the foot-work to look for tour agencies on your own, santhiya also offers a wide range of excursion and transfer services with their private transports for your convenience. being a service rendered by the resort, it'll be pricier but i'm sure the quality of service will be guaranteed excellent. 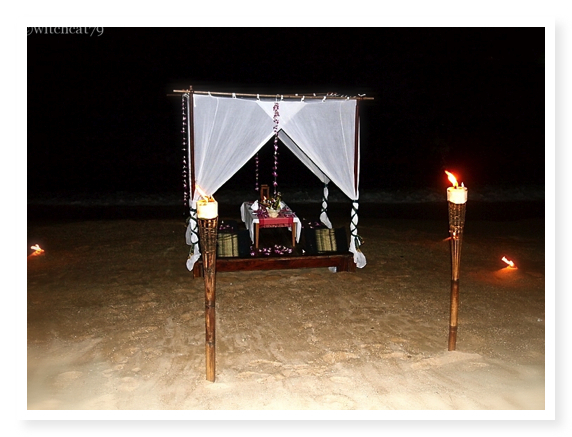 santhiya is definitely a 5-star resort which offers all the necessasity of a worry-free, total relaxation beach holiday. other than the tranquility you'll enjoy from the privacy of the beach, santhiya also offers the greeneries views of hills and vast area which gives this resort its edge. you can be guaranteed to be pampered and spoilt if budget is not your issue. 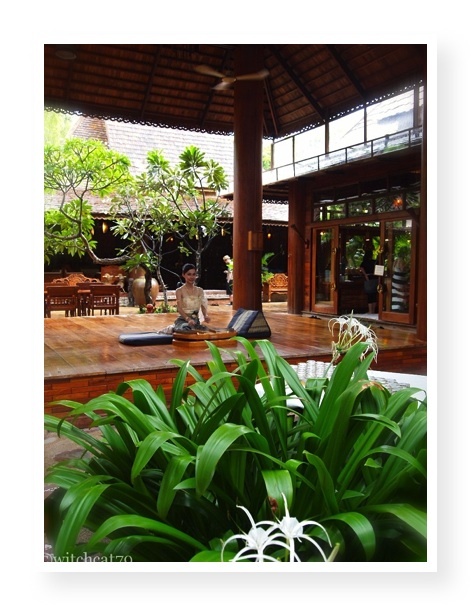 even if you are, you'll still be able to experience the uniqueness of the resort and the excellence in services of all its staff. the attention to details is something, i think, highly commandable for this resort. overall, it was an excellent experience for us. it will definitely be another wonderful memory for me and my partner as we also managed to enjoy a private dinner by the beach; a surprise that i had managed to work out with the staff upon my online bookings and only via email. 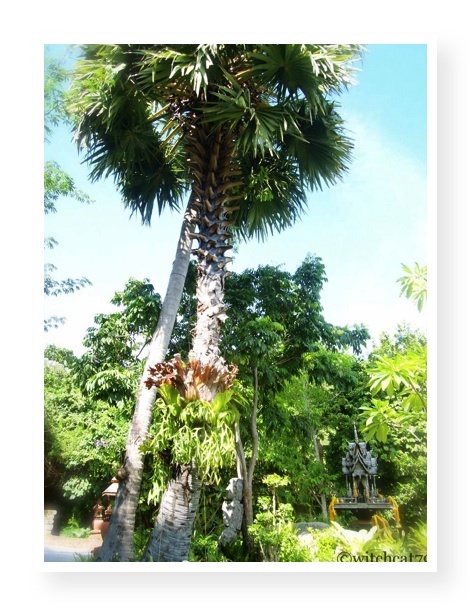 lastly, i would also like to stress on the importance of our friendly and helpful SGRS ms mary jane, who had been assisting us throughout our stay - making it wonderful & memorable for us..
i hope you'll find some interest in this article and do not hesitate to drop me any question or leave your comment. being in 2 countries that uniquely resides people of different races and cultural background lives harmoniously as one; it is only right for people who decides to reside here to respect and embrace it. it had been a long way AND time for this unique part of m'sia & s'pore to take shape thus as it is only right for us to continue upholding it. if there's a day that we need to move away from our home country, it'll also be our time to embrace the culture of another; and we can. 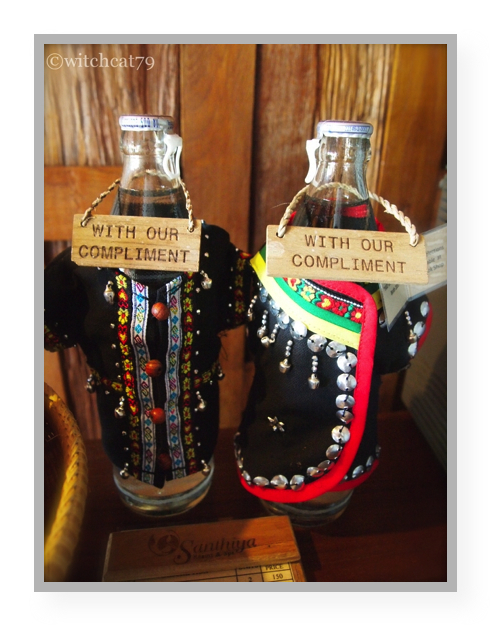 our rich multi-cultural aspect had taught us to be gracious and generous. there's also lots of patience and empathy for harmony. I'm definitely proud of these virtues and will continue to practice them. and believe it's a strong fort against all odds. today, i'm glad to celebrate; not only the day of curry-loves but a jubilee of love and harmony among a multi-cultural nation that stands as one. People who Respect Culture, should cheer for it! not that we had anything to hide, it's just being respectful. just talk, don't need to shout. oh, btw, it's british/ american English or just singlish. the next one will come shortly and pretty much on time. and the city that house us. i'm as enthusiastic as any activist for this call but my voice is small. I bet you can do more. do your part as a true-blue supporter of this harmony and spread your words. trust me.. it'll be music to the ears of many! the angel that we pray for..
for at the bend there's an angel. to someone and ring the alarm bell. unknown, used and then thrown. because life is like that and it shouldn't be all that blue. something i felt strongly after a few bad incidents. but it's part and parcel of life and part of everyone's life. don't be shy. let's tok. tok about everything under the big blue sky. i will tok, will you? have we tok about tis? what we had tok about..
the information contained in this website is for general information purposes only. tokinglekkerding is published by and reflects the personal view based on an individual capacity. the information provided by tokinglekkerding hope to keep the information up to date and correct, but the content make no representations or warranties of any kind, express or implied, about the completeness, accuracy, reliability, suitability or availability with respect to the blog or the information, products, services, or related graphics contained on the blog for any purpose. there will be link to other websites which are not under the control of tokinglekkerding. there is no control over the nature, content and availability of those sites. the inclusion of any links does not necessarily imply a recommendation or endorse the views expressed within them. 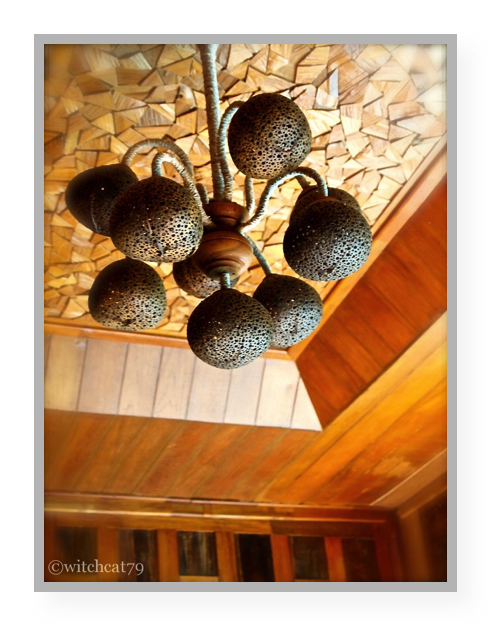 credit mention will be included for images or context abstracted from other website. should there be violation of any, please do write in to tokinglekkerding@gmail.com and the item will be taken off the blog. the content of the blog does not provide comments on a particular individual or groups unless indicated. should the content be offensive, please do write in and it will be reviewed/ revised/ taken off the blog. copyright of tokinglekkerding 2009-2012. Picture Window theme. Powered by Blogger.